I have a custom list with 3 columns, "Slno","Language","Status".Status is a choice field with choices "Ongoing" and "Terminated". 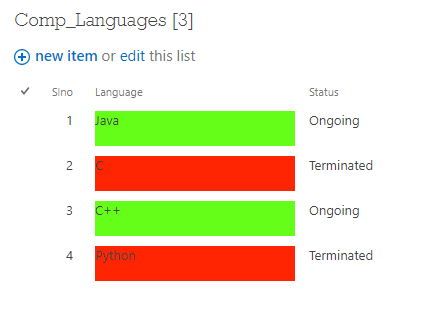 The Color of the "Language" column changes based on the "status" column value. Real Problem: I DO NOT want to display the field "Status". I tried modifying the view by not selecting the "Status"field. If I do so, nothing appears in the Language column. (Screenshot Attached). What do I do to display only "Slno" and "Language" field? How do I write the script? So your rendering problem stems from the fact that in order to get a field's value on ctx.CurrentItem during rendering, you must include that column in the view. However, in your case, you need values from a certain column, but don't want that column seen in the view. So I think in your case, something like what Stan is suggesting will work, although I'd advise finding the column index dynamically, in case the field order changes in the view. I would do that in a post-render function. // we found the Status column! // we found the Status 1 column! var header = document.querySelectorAll("[displayname='"+ col +"']").parentNode; //Recommend wrapping displayname value with an apostrophe ' to handle column names containing spaces. 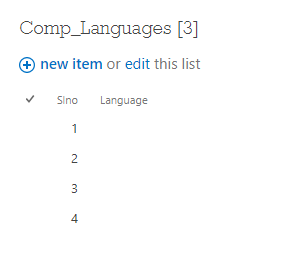 Different Display names and Internal names of columns in sharepoint List 2013. what/How to mention the column names in script? Is it possible to change the visual style of a JSGrid row?